The wealth of information about our health services is greater than ever. Go onto NHS Choices or the websites of the Health and Social Care Information Centre, Office of National Statistics and NHS England and you will find vast amounts of data and statistics about almost all aspects of healthcare. There is an increasing openness in the availability of data. But this is only part of the story. Information has to be accessible, understandable and meaningful for anyone reading it. It also needs to be used to drive improvement. That is true openness and transparency and it means more than just publishing data on a website. The NHS is taking a major step forward as nurse, midwife and care staffing data down to ward level across the country is published for the first time. This will be available in one place – a new safety section on NHS Choices alongside hospitals performance on safety reporting, infection control, blood clots, pressure ulcers and patient and staff feedback. This means that if you are a patient or relative, you will be able to examine the staffing history of a ward.The same data is seen by hospital boards, commissioners and regulators. This move establishes the NHS as a global leader in openness and transparency and is a major breakthrough in the level of information we have about our local services. The staffing-level data will compare the average actual staffing with planned staffing levels on wards – a key commitment in the Government’s response to the Mid Staffordshire public inquiry and National Quality Board staffing guidance that I commissioned and was published last year. It has been a huge undertaking and one I’m pleased to say that nurses, midwives and Trusts have embraced and pulled out all the stops to deliver on. Like any data, if used in isolation it will never reflect the complexities of patient care. And what staffing data won’t do at the moment is tell us whether a ward is understaffed or unsafe. In the future, Trusts will need to demonstrate how and why they have agreed their planned staffing levels and as we continue to develop the staffing indicator, comparing it with other information and patient feedback, it becomes a barometer for local health services as well as warning signal that will trigger questions about services. The data provides another very important piece to the jigsaw of information we have about local health services. We know there is variation in the quality of care in hospitals, even in wards on the same corridor. This data is a move away from Trust level data that can obscure this, to ward level information so we can see where this variation is. Every patient deserves great care wherever they are cared for. This will put a spotlight on any unacceptable variation. Trusts will need to explain any variation and can use the more granular information to put targeted improvements in place. This is the first time this data has been published and while it is an important step, there needs to be a bedding-in period where Trusts can refine their planned levels and we develop a fuller picture of where questions need to be asked. This allows Trusts to more accurately plan staffing requirements so that we have the best ward teams to respond to the needs of their patients. Clearly presenting information also puts services more closely in the public spotlight. Patients can make more informed choices and we know from the example of heart surgery, that publishing data leads to service improvement. Earlier this year, I commissioned NICE to review staffing guidelines. Their first guidelines have been for public consultation and NICE will publish the results this summer. And getting staffing right is an ongoing process. It is meaningless to look at a national statistic and make a judgement about nurse and midwifery staffing requirements. There are more nurses in the NHS than ever before, true. But need is greater than ever before and staffing requirements differ between wards, specialties and communities. The focus needs to be on unacceptable variations, not only for patients but for staff who need the support to provide high quality patient care. Publishing more accessible and meaningful data will lead to greater public scrutiny, which will drive improvement. As ever the response from the NHS in undertaking this piece of work has been remarkable. In years to come, we will see this as a watershed moment in the move to a more sophisticated approach to staffing. 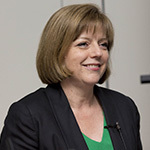 Professor Jane Cummings is the Chief Nursing Officer for England and Executive Director at NHS England. Jane specialised in emergency care and has held a wide variety of roles across the NHS including Director of Commissioning, Director of Nursing and Deputy Chief Executive. In February 2004, she became the national lead for emergency care agreeing and implementing the 98% operational standard. She has also worked as the nursing advisor for emergency care. In January 2005, she was appointed as the National Implementation Director for ‘Choice’ and ‘Choose and Book’. Jane moved to NHS North West in November 2007 where she held executive responsibility for the professional leadership of nursing, quality, performance as well as QIPP, commissioning and for a time Deputy Chief Executive Officer. In October 2011, she was appointed to the role of Chief Nurse for the North of England SHA Cluster. She was appointed as Chief Nursing Officer for England in March 2012 and started full time in June 2012. Jane is the professional lead for all nurses and midwives in England (with the exception of public health) and published the ‘6Cs’ and ‘Compassion in Practice’ in December 2012, followed by publishing the ‘Leading Change, Adding Value’ framework in May 2016. Jane has executive oversight of maternity, patient experience, learning disability and, in January 2016, became executive lead for Patient and Public Participation. She was awarded Doctorates by Edge Hill University and by Bucks New University, and she is a visiting professor at Kingston University and St George’s University, London. She is also Director and trustee for Macmillan Cancer Support and a clinical Ambassador for the Over the Wall Children’s Charity where she volunteers as a nurse providing care for children affected by serious illnesses. Follow Jane on Twitter: @JaneMCummings. I think it is about time that capability and capacity are recognised within the nursing profession,patients need to have comfort in the fact that their care is adequately recognised.All too often we here about staff that are only in the profession due to the fact there is no alternative employment in certain depressed areas,where is the compassion when you talk about abuse or lack of duty of care within the profession.I am a service user and also a whistleblower who has experienced poor care at the hands of so called professional nurses. While i suspect we all support increased transparency, I am left wondering whether a spreadsheet that calculates “safe staffing” to 13 decimal places is in fact providing that transparency. Why not print the number of ward nurses reported, the denominator for safeness, and then we can all view the data transaprently and compare numbers of people with each other rather than the resulting percentages. I think that 98.776542975% is only more helpful, meaningful and transparent if I know that whether it is applied to 10 Nurses or 700. The NHS need to be open, honest and tell the full story, there is not only a significant variation in the quality of care but also in the quality of data. This is just as important as if there is no openess and transparency about the quality of data then providers may be pressurized into publishing misinformation. Let’s go beyond getting data on a website when we have completed that stage. Look at Reading’s public JSNA – wholly inadequate – where is the preventable mortality – by CCG? Analysis of causes of death?